Multicellular organs consist of collections of cells which come together to achieve what individual cells cannot. The establishment of order in complex tissues has long been a subject of interest, dating back to the origins of microscopy itself. Previous studies have proposed rules which predict when a cell will divide, using both its developmental age (adder) and size (sizer). Further studies in plants and animals have proposed rules which predict how a cell will divide by looking at the local geometry of a cell, it is predicted to occur using the shortest wall possible which passes through the centre. These rules apply at the level of single cells, yet their consequences for multicellular tissues remain unknown. In other words, how these rules give rise to tissues, and the properties of these cellular arrangements, are not well understood. Plants produce a striking diversity of structures, including the leaves and seeds that we eat. These above-ground parts of the plant all come from the stem cells in the so-called shoot apical meristem (SAM), a chaotic-looking mass of cells at growing tips of plants. These stem cells grow and divide to produce the structures that we see. In Jackson et al., we investigated how the rules which govern the control of the cell cycle and placement of division plane act within the SAM to generate emergent properties in this collection of cells. Confocal laser microscopy and computer analysis revealed how the organization of cells in the SAM changes over time as cells divide. The microscope we used allowed us to reveal the internal structure of the SAM (see picture), and identify when and how cells divide. We then used network approaches, applied by neuroscientists to understand the organisation of brain cells, to reveal the global structure of cells in the SAM. In particular, we looked at “short paths” through the SAM – the routes that provide efficient ways of getting from cell A to cell B. We found an unexpected result: cell divisions occurred in a pattern that avoided short paths becoming overly reliant on individual cells. Once a cell begins to feature in many short paths across the SAM, it tends to divide in a way that provides a wider range of short routes connecting cells. This prevents individual cells from becoming too important in the movement of information, and creates a more equal community of cells. Figure: Imaging the shoot apical meristem (SAM) over time allowed us to see which cells divided, and how they did so. We found that cells divided in such a way as to decrease the dependence of “short paths” through the tissue on individual cells. As a metaphor, plant stem cells are organized more like a pre-planned North American City using a grid-like system, as opposed to the more heterogeneous street patterns seen in the Old World. This more homogeneous layout is more robust to failure – if any single path is compromised, it doesn’t cause a major traffic jam. What might compromise a path through the SAM? It’s a part of the plant that, for example, is prone to herbivory (being eaten by pests). Ensuring that there’s a range of short paths through the SAM, rather than just one highway, means that if individual cells are eaten, information can still pass between cells. Supporting this picture of robust information flow, we found that the homogenous organization structure appears to be important for the correct positioning of flowers. When the organisation is disrupted in mutant plants, flowers are misplaced. This supports the functional importance of this global equality of cells in the SAM. 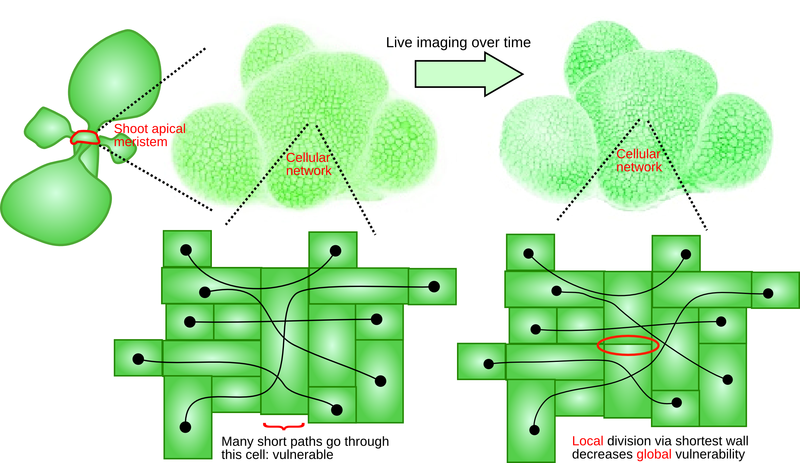 This work provides a step forward in understanding how local cellular behaviour (when and how cells divide) gives rise to the global properties of tissues (robust short paths across the tissue). This is an example of “emergence”, where the actions of individuals give rise to surprising behaviour of the population as a whole. We hope that this quantitative picture will help advance our knowledge of how organs are designed and what functions they can fulfil.